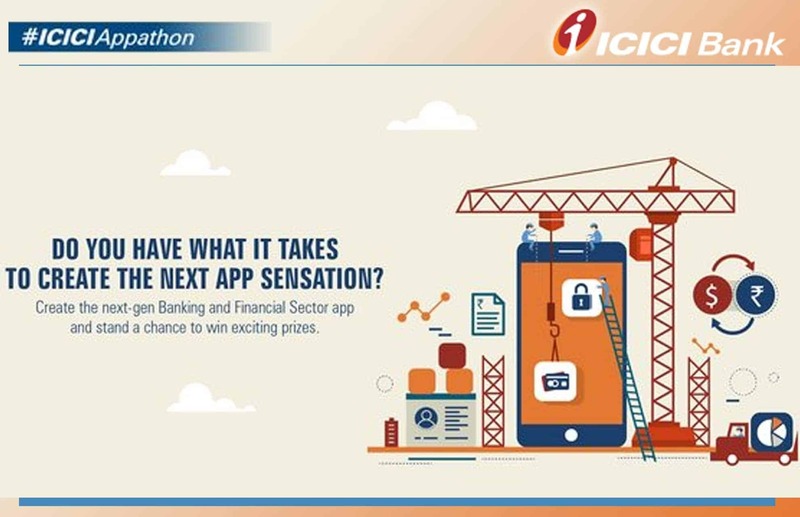 ICICI Appathon - A Virtual Mobile App Development Challenge! ICICI Bank in collaboration with IBM & VISA is launching a Mobile App Solution development programme – ICICI Appathon. The bank is looking for developers, technology companies, startups, technopreneurs and students who can create a new mobile banking solutions app which can excel the quality of currently available solutions in the market. ICICI Bank’s ‘Appathon’ programme aims to encourage skills of development along with a perspective to enhance end-user experience. ICICI Bank has hosted a range of 50+ BSFI APIs on the IBM Bluemix, a cloud-based platform. Participants are supposed to use these APIs to come up with a new Mobile Banking Solution App. In addition to ICICI API’s (including APIs of ICICI Prudential Life Insurance, ICICI Lombard General Insurance and ICICI Securities), the developers can also additionally use API sets made available by programme partners like Visa, NPCI and other open source libraries. All interested candidates are supposed to register with ICICI Appathon (http://www.iciciappathon.com/) & fill their application. While filing the application, participants need to identify the current business problem and propose a solution & its benefits, mentioning the categories of APIs they are going to use. In Phase 1 the teams will be shortlisted based on their application. The shortlisted candidates for Phase 2 will have to submit a functional prototype of the Mobile App or Solution which can be accessed via mobile. They can use multiple technologies for the same but, at least, one API should be used from ICICI’s hosted APIs. All development will be done on Bluemix Platform. Finalists for Phase 3 will be decided based on the prototype and its implementation. Participant finalists who have qualified for Phase 3 will be invited to ICICI Bank Towers, Mumbai with their brief presentation, final functional prototype solution and the devices they would need to demonstrate the developed mobile solution. The Jury, eminent leaders from BSFI & Startups, will then pick Top 3 winners awarding them with prizes from a pool of over Rs. 20 lakhs along with other exciting goodies. Finalists will be selected based on the Uniqueness, Functionality, Business Potential, User Experience and Scalability of their prototype & solution. Along with cash prizes, the winners will also be fast tracked in NASSCOM’s 10,000 Startups programme. Also, 2 members of the winning team will get a full-time 3-month membership across 91springboard co-working community hubs in India.